Enjoy from your screened in balcony, beautiful views of Sanibel Island and sunsets every night over the sparkling waters and barrier islands! 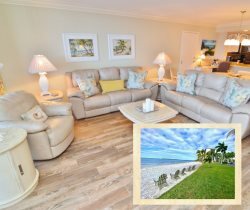 Like all of our Fort Myers, Florida vacation rentals, this condo is well-appointed and sea life inspired. This unit has tile flooring throughout, updated kitchen and bathrooms. The master bedroom has a King bed and the guest bedroom has a Double and Twin size bed. There is a large flat screen TV in the living room and both bedrooms, and a DVD player in the living room. You may have found this rental on HomeAway 4363840, HA ID 4363840, VRBO 4363840, or Vacation Rentals 4363840. We had a great time. The condo was beautiful and the view was awesome! Will definitely stay again next time we are in the area. We didn't really have a need to require their help, but were very friendly while booking the condo. Was a lovely condo, great layout, fantastic view, had everything we needed (except for a cheese grater). Would highly recommend. The property was in excellent shape. The unit was very clean and well kept. The only thing that I would like to suggest is to have grills on site for guest use during the stay. We had a very relaxing trip. Every evening and every morning we were visited by dolphins that we could watch from our patio. This location is close to everything yet tucked away and quiet. We will be back next year! We plan on bringing friends with us! Great stay and the pool was awesome! My only recommendation would be working with the Marriott to negotiate better hours for gym access. Hotel guests have 24 hr access but paying weekly members are only permitted 8:30 am to 6 pm. The only thing I wished we had was a clock in the master bedroom. Everything else was perfect! We enjoyed the whole experience. We will come back in the future for sure.